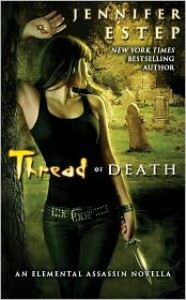 The Thread of Death totally rocked. It has lots of action, a touch of mystery, lines that make you sigh and a ll of my favorite secondary characters made an appearance, and I have to say Finn totally steals whatever scene he is in. I love that guy! I also enjoyed seeing some of the lesser characters that haven't had much of an impact on the series until now have a larger role in the story. All I can say is that only Gin could make a funeral a place of action. While she's attending the funeral of Mab someone starts shooting at the crowd. There are so many of Ashland's crime bosses in attendance at the funeral, it's hard to tell at first who the shots are meant for or who hired the shooter. It soon becomes clear that they are meant for Gin, and she takes action like she usually does. It was nice to see Gin back in action as the spider, and she really is one of my favorite Urban Fantasy heroines. She's really not afraid to use her elemental magic on any one who causes harm to her or her family. However, with Owen by her side she becomes a softer person and I love seeing that side of her. 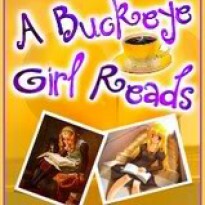 There were a few surprise points of view in this novella I didn't expect and that totally surprised me as the books are normally told by Gin's point of view. I enjoyed those because we learned a little bit more about Owen and it made his past be all that more mysterious. I seriously can't wait to learn more about him. This series never disappoints me, and I can't wait for book six: By A Thread. Owen looked at me, a troubled light flaring in his violet eyes. "Are you sure you want to do this? he asked. You don't have to, you know."